Hey all! I'm back from my week in paradise! Lol! I had the most amazing trip ever! Already trying to figure out when I can go back! And even wanting to give Disneyland a try...just to compare! LOL! I'm still totally exhausted too. I was waking up an hour or so earlier than necessary to get myself to the right park on time for opening moments. Add in that I had to wake up at 2:30am yesterday to catch my 3:15am shuttle to the airport, I think it's safe to say that I will be going to bed super early tonight! As it is I already took a cat nap this afternoon for three hours and still feel lightheaded and exhausted! But it was tons of fun! 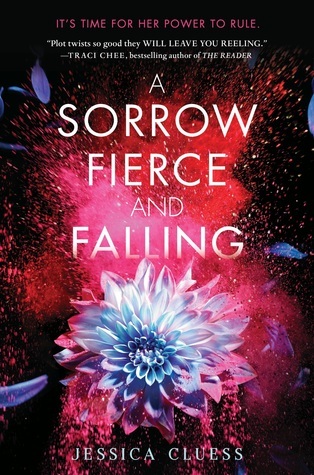 A Sorrow Fierce and Falling by Jessica Cluess--keeper copy! Six of Crows by Leigh Bardugo--the gorgeous collector's edition!! The Grim Lovelies (double-sided) tote bag! I also got my Owl Crate...which wasn't as spectacular as I had hoped because I was spoiled for it yet again. Sigh...I can just vaguely remember the first few boxes I received that were total surprises! Those were so nice. Getting a box and knowing its every content isn't as magical. But I won't spoil it here for you if you've managed to remain unspoiled. I wait for the unboxing week the following month before posting anything! Overall though I liked most of what was in here! I knew going in the contemporary retelling of a classic wasn't going to be for me and two of the companion items aren't really my thing either, but the rest was pretty amazing! And then just a peek at some of my souvenirs from my trip! I went a little overboard! Not pictured are a spirit jersey, a photo album, my Minnie Ears headbands (though one of which I bought ahead of time! ), some items of necessity, and my pressed penny collection! I've collected those for years and as I got older, decided to buy more when I go to places with them! a Mickey pashmina, the Haunted Mansion playing cards, plus Haunted Mansion music box, a Halloween slap bracelet that was just too cool, some more pins for my lanyard; it's a Slinky Dog Roller Coaster, a Toy Story/Haunted Mansion combo, and a special Mickey's Not So Scary Halloween Party pin with Goofy dressed as popcorn, then there's the Mickey's Not So Scary Halloween Party canvas bag, and a piece of Cursed Aztec Gold from Pirates of the Caribbean--because I'm a coin geek! Then at Universal I got my wand that I had choose since I was once again passed over twice. What really aggravated me was that the kid that was "picked" already had a wand! But it was still fun. I actually picked the wand that was chosen for me by Pottermore or as close to the picture I had of it! It's a 12 3/4 length wand made from Pear wood with a Phoenix Feather core. Oh yes, I blindfolded myself to print out my answers to serve as a backup should this very situation happen! Lol! Then I also bought my coin set that I was wanting from Gringotts and another chocolate frog! I haven't opened it yet. I was afraid to as I was forced to wait in a warm car with it while I was being transported back to my hotel. I'm scared he won't look froggy even though I stuck him in the fridge upon returning! And that was my most amazing and magical week! I'm still recuperating from it all. My legs are sore and there's sunburn on my arms and whatnot. Plus being totally jet-lagged and exhausted from an early flight! I might not really be around today, but since Monday is a workday I will be back in blogging action then! Glad to hear you had a nice trip. I liked Disneyland. It's smaller, but there was something really awesome about the vibe of the people that worked there. You could tell how much they loved Walt Disney, the man. I did that park as an Adventure by Disney, so I got to see/do some really cool stuff. Oh no! I'm sorry you didn't get picked at Ollivanders! I'm glad you were still able to get a wand though. 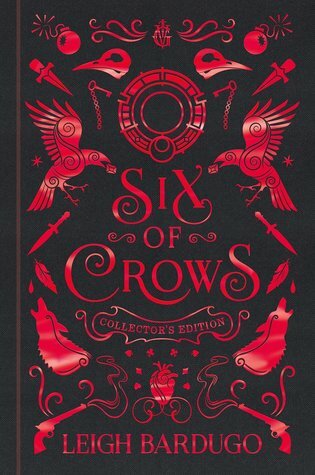 I didn't know there was a Collectors Edition for Six of Crows out! And sorry you keep getting spoiled for the OwlCrate boxes. I haven't bought one in a year, but it's so obvious on Instagram when boxes start shipping. It looks like you had a great time at Disney, the worst part is going back to work.